Enclosure size and/or airflow can’t be increased. 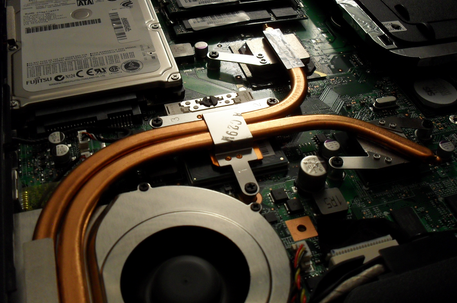 Transitioning to a solid copper heat sink, in whole or in part, adds too much weight and in some cases too much cost. Component power /density necessitates heat be moved to a remote location more than 40-50mm away from the heat source. Regardless of the reason, most thermal engineers are going to need a two-phase cooling solution using either heat pipes or vapor chambers on numerous projects with which they are involved. But, which one is likely the best choice? In today’s blog I’d like to do a topline overview of structural differences and thermal design considerations between these very similar yet somewhat unique two-phase devices. It probably goes without saying, but the operating principles of all two-phase devices are identical. A wick structure (sintered powder, mesh screens, and/or grooves) are applied to the inside walls of an enclosure (tube or planar shape). Liquid (usually water) is added to the device and vacuum sealed at which point the wick distributes the liquid throughout the device. As heat is applied to one area, the liquid turns to vapor and moves to an area of lower pressure where it cools and returns to liquid form whereupon it moves back to the heat source by virtue of capillary action. In this sense, heat pipes and vapor chambers are the same thing. For simplicity’s sake, I’ll be focusing on the most common type of two-phase device: an all copper vessel, using a sintered copper wick structure with water as the working fluid. For decades, heat pipes have been the default two-phase device of choice for thermal engineers due largely to the cost difference relative to vapor chambers. They were used both for heat transport, for which they still have an advantage, and for heat spreading, typically using multiple pipes in close proximity to one another. For lower power applications, perhaps requiring only a single, small heat pipe, or those where heat must be effectively transported, heat pipes still maintain dominance due to their low cost and design flexibility. Greater total power and power densities eventually led to multiple heat pipes being used to solve the thermal challenge. Both images below are heat sinks for a small form factor, high performance desktop PC. 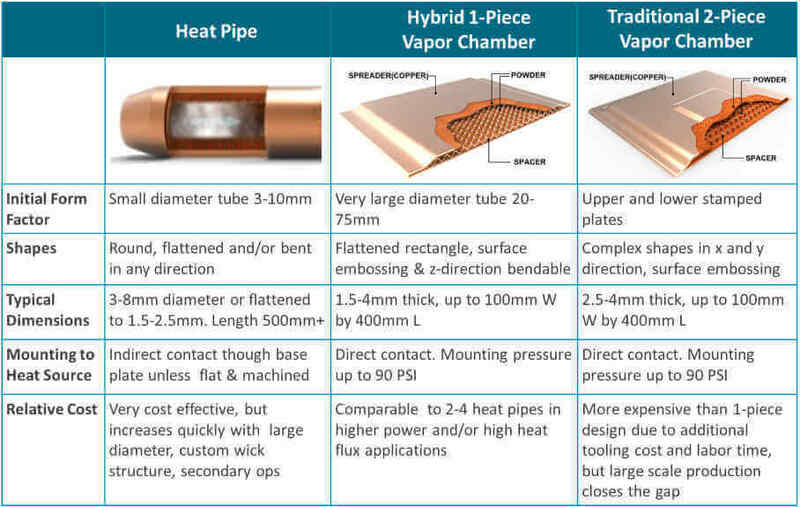 The one on the left uses a copper base plate in between the heat source and the heat pipes, as is common with heat pipe applications (indirect contact). As processor heat increased in the subsequent generation of this product, the company encountered thermal issues, but did not want to radically redesign the thermal solution as can be seen on the image to the right. Here a vapor chamber replaced the copper base plate, spreading heat more evenly across the heat source and transferring it more effectively to the heat pipes. This is a great example of how both types of two-phase devices can be used together. A potential alternative to this problem might have been to implement what some call ‘direct contact’ heat pipes. But, this solution has its drawbacks as well. As seen below, this design option uses slightly flattened and machined heat pipes cradled in an aluminum mounting bracket to make direct contact with the heat source. While eliminating the base plate and additional TIM layer – decreasing thermal resistance – it doesn’t spread the heat as effectively as a vapor chamber solution. Most manufacturers of vapor chambers use a traditional two piece design. While studies and practical application shows that the performance of heat sinks using vapor chambers can be enhanced by 20-30% over their heat pipe counterparts, a two piece design has cost implications of roughly the same magnitude versus a multiple heat pipe configuration. Nonetheless, vapor chamber usage has grown with the increasing power and power densities of today’s devices. Because they do an incredible job of spreading heat, allow for low profile heat sinks, can be made into virtually any shape, embossed, and make direct contact with heat source, these devices are used in a wide variety of higher power applications. Below are two examples of heat sinks using two-piece vapor chambers. As mentioned earlier, the increased cost of this design sometimes limits its incorporation into thermal solutions. Another potential drawback is that there’s little design flexibility in the z-direction. Making a U-shape for instance, while conceivably possible, would be impractical from a manufacturability/cost perspective. Available from a growing number of manufacturers, one-piece vapor chambers are a cost reduced version of their two-piece counterparts, yet maintain the thermal performance characteristics while adding some unique capabilities (e.g. U-shape bending). Like heat pipes, a one-piece product begins its life as a single copper tube, hence the 1-piece moniker. Like traditional two-piece designs, one piece vapor chambers make direct contact with the heat source, have a multi-directional heat flow, and can support clamping forces of up to 90 PSI. But they’re less expensive to produce because they require less tooling, don’t use individual support posts, and don’t have to be welded on all four sides. Below are a few examples of one-piece vapor chambers. The thing to remember about two phase devices is that heat pipes favor moving heat over spreading it, while the reverse is true of vapor chambers. For sure, there are numerous thermal challenges where either could be used with good results so it’s important to do a thorough review process of both designs for settling on one. A typical, although not ideal, thermal design scenario is one in which several key variables are already defined. These include enclosure shape / size, component layout (with associated keep out zones) and airflow, as well as the total power, power density, and size of the heat source(s). Given these constraints, the focus is on the heat sink itself and one should start by understanding if the condenser is remote or local to the heat source. If remote by more than 40-50mm begin the investigation with heat pipes. Design flexibility is high allowing bending and flattening to conform to almost any shape in all three dimensions. If local and copper alternatives have been ruled out then a vapor chamber solution that spreads the heat is the best starting point provided the perimeter ratio of the heat sink to the heat source is greater than 30:1. Based on this input a simple excel model should be run to determine the performance of the heat exchanger. This tells us how much of the thermal budget – fin to air and air temperature rise – are being used. This provides information on how much is left for conduction and interfaces. Since these two components, fin to air and air temperature rise, are the largest resistances in the system, the tail that wags the dog, a design review at this point is normal to optimize the area for the fins and the air flow and pressure drops. 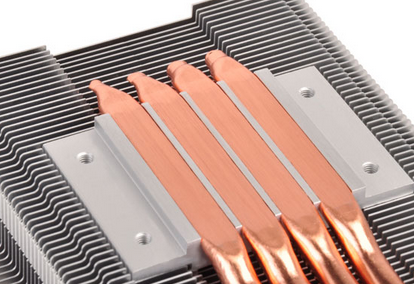 If the remaining thermal budget for conduction is less than 10oC, a look at copper or heat pipes. For small devices at low powers a single heat pipe is often sufficient. 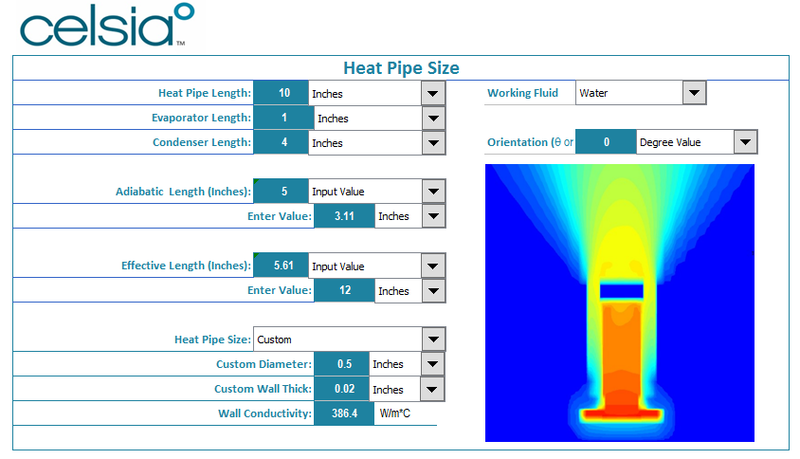 With the total power we can estimate the number of heat pipes required to carry the heat. For example, a single 6mm heat pipe can carry the power from a 45 watt device. If it is less than 5oC then a vapor chamber may be required. For small devices at high powers typically a vapor chamber is the best solution. Vapor chambers, on the other hand, generally are not run to their performance limits so they are sized to cover as much of the base of the heat sink as possible. Due to their flat format there is a direct contact between the VC and the heat generating component. The above image is the summary page of such a model for an LED application. In this example two 8mm heat pipes were compared against a single 15mm wide vapor chamber of similar cost. Each ‘case scenario’ represents the use of different length fins. As you can see, the vapor chamber solution provides an additional 4-5 degrees Celsius of thermal headroom, but this delta is often higher. Available soon on Celsia’s website, but also downloadable from several other sources, a more comprehensive heat pipe and vapor chamber modeling solution will aid in refining the two-phase design as it accounts for changes to wick characteristics, vapor space, wall thickness, working fluid, case metal, and orientation. Subsequently, CDF modeling is often used to determine the performance of variations to the full heat sink assembly. However, sometimes the best use of time and money is simply to prototype and test a couple of thermal module iterations. Please contact us, if you’d like to learn more about how Celsia can help with your next heat sink project. We’ve worked on everything from consumer devices to industrial test equipment that require heat sinks to cool anywhere from a few watts to a few kilowatts.